You are here: Home / Ministry / Are Pastors Held to a Higher Standard? This post, Are Pastors Held to a Higher Standard, is written by my friend, Dylan Manley. Dylan blogs over at BeardedApologetics.com where he writes about Christianity, ministry, and apologetics. Dylan is a graduate of Liberty Theological Seminary and works as a youth pastor at Columbus Avenue Baptist Church in Waco, Texas. Our topic today is one of some controversy. More than once, I’ve heard it said that my husband, a senior pastor, should be held to a higher standard than other Christians because he is in vocational ministry. My response has always been that first, and foremost, he is a Christian and therefore he should strive to model himself after Christ – just like me and every other Christian. However, I don’t have a seminary degree or a blog about apologetics, so let’s take a look at what Dylan has to say. I’ve been in a ministry or pastoral role for nearly seventeen years now, and in that time, I’ve made more than my fair share of mistakes. I’m not just talking about scheduling or administrative mistakes within my church, but I’m talking about real life blunders. I’ve acted out in anger, I’ve spoken words that I shouldn’t have (Colossians 4:6), I’ve been selfish, prideful, and in some cases, I’ve not been the kind of father and husband that I am called to be. In these moments, and others unmentioned, I find that I am easily my own worst critic. I preach to myself a message of condemnation instead of forgiveness, shame over mercy, and fear instead of freedom. In all these things the question that is begging to be asked is, why? I think part of the answer stems from the idea that other people hold me and my actions to a higher standard. There is a basic idea that, as pastors, we are set above others, and as public figures who proclaim the Gospel of Christ, we are therefore not allowed to make any of the same mistakes others in varying positions make. Sure we’re still human, but the consensus seems to indicate that even that fact does not alleviate us from an acute public verdict. Whether pastors want this kind of scrutiny or whether scripture allows for it or not is irrelevant it seems. Most pastors (including myself) often arrive at the conclusion that this view is inescapable, and we just attempt to deal with it as best we can, but the question I want to seek to answer in this post is SHOULD it be this way? The first place we should look for this answer is, of course, the Bible. This passage clearly tells us that leaders/teachers (i.e. pastors, ministers, elders, etc.) will be judged with greater strictness, and for that reason, a warning is issued that this is not a role that should be embarked on by everyone. The question is in this passage, who is the one doing the judging? Let’s try to unwrap this a little further. If a person takes on one of these leadership roles within the body of Christ, then the standard is in many ways higher for that person. But we need to clarify that the standards that person is called to and judged by are not men’s, but rather these standards are defined and judged by God Almighty. This means all those who are in these roles are held accountable to and by God. This is a truly sobering thought. The work that pastors, elders, minister, overseers, etc. do will be put into God’s crucible and tested. Either that work will be consumed and burned away or it will be purified (1 Corinthians 3:12-15). Because these people are trusted with leading and building the Church (not just the local congregation, but the body of believers in a global sense) to lead a Jesus-shaped life. Therefore, if a person in one of these leadership positions decides to lead the Church astray, there is a severe penalty for disobeying the call that is placed on such individuals. There is within these people a certain responsibility to lead, equip, disciple, teach, and send others to go and make much of the name of Christ, and when this responsibility is either not met or forgotten a more severe consequence is sure to follow. The Gospel of Luke teaches that to those to whom more responsibility is given there is a correlative expectation of standard of expectation, and should this be forfeited this person can expect severe repercussions (Luke 12:47-48). Paul solidifies this again in his first letter to the church at Corinth when he speaks of anyone who attacks or destroys God’s temple, i.e. the church (1 Corinthians 3:16-17). The Bible leaves no doubt that not only pastors but every person in a leadership/teaching role within a church will absolutely have to answer for what they did or did not do. This particular point is not debatable. If you find yourself in one of these positions, then please know God has placed you in a place where you are responsible for leading, shaping, and growing the souls who will ultimately go and lead others to do the same thing. 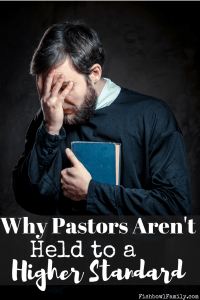 It is a massive calling and failing to meet this call after you’ve answered will have repercussions, but that leads to the second portion of the question, should we as people hold pastors to higher standards than those others and ourselves? A real danger that occurs within the church is the elevation of people. It’s natural and easy to look at someone in a pastoral role and want to put them on pedestals and regard them with higher admiration, but what does this really do? I think it, unfortunately, results in a couple of errors. 1. When we set pastors on pedestals we set ourselves up for disappointment. I’ve heard this statement (or some variation of it) more times than I can count. Listen, your pastor is in a place of authority and has a great responsibility upon them, but let’s not forget that these people are just that – people. No matter how much we may want to elevate certain people, at the end of the day they are really no different from anyone else in the fact they have sin hardwired within them (Romans 3:23). As a result of sin, even pastors will eventually let us down. Your pastor has/will let you down. They have said or done something that upset or offended you. They’ve wronged you or someone you know. As a result, our first instinct is to be egregiously offended that this person whom we placed in a lofty position has let us down and disappointed us. The reality is every pastor on the planet is fallible. If they haven’t let you down yet, just wait. They will disappoint you not because they want to, but simply because, like you, they are people afflicted by sin. 2. Elevating people often leads us to put our faith in them instead of God. I don’t think it is intentional, but when we look at our pastors with these vast expectations we often start to view them as if they should not even struggle with sin. When this kind of view happens, it creates this falsehood that these pastoral leaders are to be regarded as infallible, which of course they are not. This is obviously problematic because there is but one God, and your pastor isn’t Him (Deuteronomy 6:4-6). When we elevate pastors, we fail to see them as people, and we begin to see them as something more. But truthfully (and speaking from experience) this is a burden that is impossible to carry from any position. We are called to make less of ourselves and more of Jesus (John 3:30), and yet here we are trying to make more of a pastor than we ought. We end up blindly following someone in a pastoral role (even if they’re wrong) because we’ve made them to be something they’re terrible at – being God. Listen, the bottom line is this – people in pastoral roles are called to be the hands and feet of Jesus, but that does not mean they are somehow free from sin or failure. No matter what kind of position a person is in, as Christians we all have the same basic call on our lives: to be ministers (Romans 14:12). Whether this is done in a pastoral or vocational role or a position that is completely exterior to the church, the call and ending are the same. Yes, pastors have to give an account to God for what they’ve done, but so do all Christians. There will be a day when we stand before God in judgment (2 Corinthians 5:10), and this is not specific only to pastors but for all believers. First, pray for your pastor every day. Pray for their leadership, their families, their decisions, and their sensitivity to the Holy Spirit. Ministry is an incredibly joyful vocation, but it is also one that often leads to loneliness and depression. There is a huge weight on the shoulders of pastors, and that burden does not need to increase from unrealistic standards. Second, be honest about your pastor’s failings and quick to offer forgiveness. When your pastor messes up, go to him. Let him know that, although he was wrong, you want to forgive him. Your desire should be to help him grow as a pastor and Christian. Yes, pastors are accountable and entrusted with some very heavy things, but they still need the same measures of grace that we extend to everyone else. As believers in Christ, your role is the same as any pastors in the sense that we lead others to Jesus and live a life that glorifies Him in all ways. Don’t get caught up in titles or vocations, but rather work together with your church to make the most of Jesus wherever you may be. What do you think? 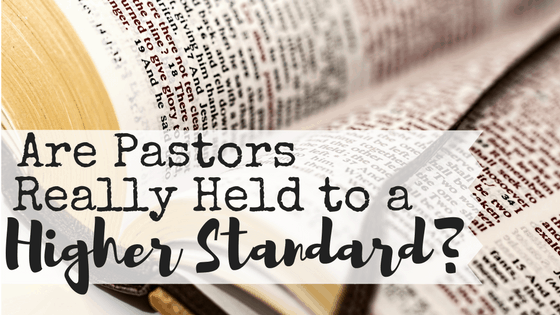 Are pastors held to a higher standard? Tell us in the comments! Be sure to check out Dylan’s blog at BeardedApologetics.com and follow him on Twitter, Instagram, and Facebook. Well stated, Dylan. In my 73 years, i have experienced may pastors, good, bad, and indifferent. However, I always seek to discover the true biblical message the pastor, hopefully, delivers to the congregation. It is our responsibility to grow spiritually from the content of that true message, and I have been able to find it from EVERY pastor in every congregation I have visited. It is NOT my responsibility to judge or condemn a pastor’s foibles and misdeeds. That belongs only to God. It is true that congregations have elected groups, be it council, board of deacons, or whatever, to advise and direct the pastor on secular matters involving the church. It may be that the behavior of a pastor directly impinges on those matters and consequences may arise. Even when it rises to the level of dismissal, we must remember that we are expected to forgive as God forgives, but not to condone. Do not recall the misdeeds of the individual but rather the wonderful teachings you received. If you listened carefully, those teachings were frequently there. The Bible says that leaders are held to a higher standard. That is to be judged by God, not me. I’m not the Holy Spirit. It is my job to love and encourage, not to set the standards. A great article. Halee, you said that Dylan is a youth pastor at Columbus Ave Baptist Church. Would you believe that I worked there 3 years or so as secretary to the music minister at the time? This article is very thought provoking. I know the Bible says pastors should be held to higher standards but not because of us, because that’s what God said. My husband always used to say it’s a matter of position. Pastors are shepherds over the flock. Like marriage the husband is by position put by God over the wife. It’s not a matter of “lording” it over the wife. Somebody has to be the leader. Each is in submission to the other under God. When it comes to pastors, God holds them up by position. We should not. But we should remember he is the one called to teach us. We are not called to be his judge. We are both human and yes, we should uphold him in prayer. By his works we shall know him. When a pastor has brought many young families into the church, has seen many come to know the Lord, has baptized many and, most importantly, preached powerful and practical sermons that are very Biblical, his congregation should uphold him, pray for him, work with him. We, also, are called to a high calling of becoming like Christ. Those who are dead set on not working and helping should find a place where they can. Thanks Beth! I bet you were a great secretary! Your husband sounds like he was a very wise man. We love you and loved serving the Lord beside you!